Grape to Glass, the lifestyle venture of seasoned wine connoisseur Shagun Gupta has launched the latest editions of handmade decanters from Riedel in India. Shagun relishes the flavors of delectable vintage and has great sense of appreciation for wines from different estates, regions, and countries. Grape to Glass is exclusive distributor for Riedel, undeniably the finest wine accessory brand around the globe. 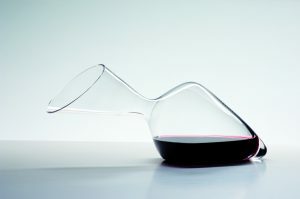 Riedel, credited with revolutionizing glassware for the enjoyment of wine, announces a decanter that works with every Riedel series, the “Riedel” Decanter. 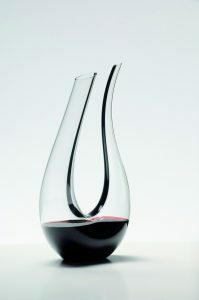 As with all of Riedel’s handmade decanters, each piece is a unique work of art, and designed for a single bottle of wine. These decanters offer great functionality and have a wonderful artsy feel to them. Each decanter is mouth-blown and handmade meticulously to achieve their striking designs and achieve a smooth and effective decantation process. The art of optically blown glass originated in Venice, the cradle of the most superior glassblowing techniques. The precise angles and graceful shape have been made to aerate the wine and release flavours and aromas that will enhance your wine drinking experience. Shagun Gupta recommends Amadeo and Cornetto for more mature wines and for champagne. Mamba is perfect for young, wild wines that benefit from this decanter’s dual decanting function. 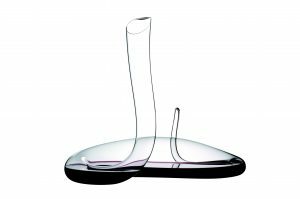 The Sommeliers Black Tie Face To Face wine decanter from Riedel is designed to pair with the Riedel Sommeliers Black Tie stemware, but can easily stand alone as your most favored decanter or modern art piece. Black Tie Bliss is one the most romantic pieces each adorned with sophisticated ribbon black crystal. There is no more elegant bird than the Swan, so it only fitting that their new Swan decanter should embody the same natural grace. To enjoy young wines fully (up to 10 years for both red and white) consider opening them 8 – 12 hours prior to consumption for aeration, or decant the wine, as this shortens the aeration process. The main preservation element in wine is carbon dioxide, which is integrated with the wine during the first (= alcoholic) fermentation. Decanting reduces the amount of carbon dioxide and “matures” the wine, allowing the bouquet to develop faster. On the palate, decanted wine expresses higher levels of fruit in red wines and tends to integrate and smooth out tannins. When decanting young wines, turn the bottle straight into the decanter and let it splash into the vessel, allowing maximum aeration. When decanting off the sediment of an old wine, slowly pour the wine into the decanter without allowing any sediment to leave the bottle.